I think most collectors of GB stamps know that when Royal Mail announce the programme for a year, it is only half (or less!) of the story. 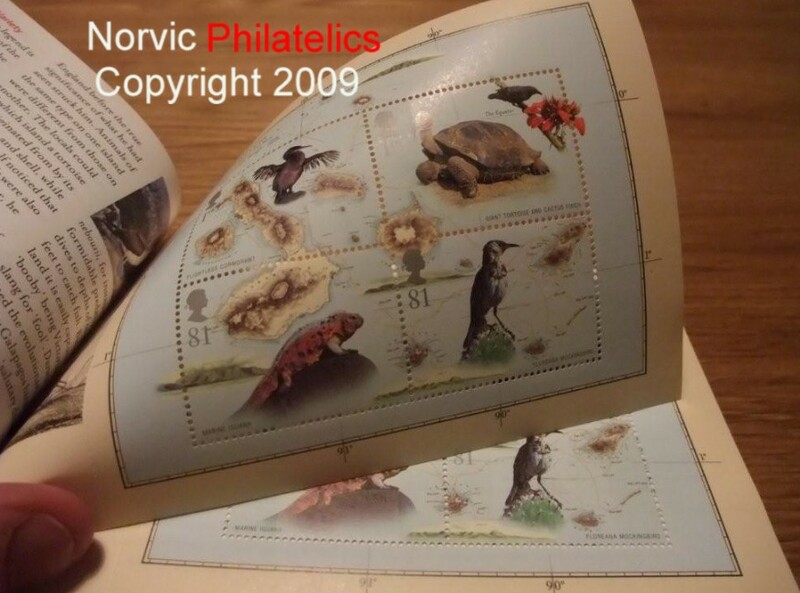 There are often retail booklets, Smilers Sheets, and the now infamous 'subjects that didn't make it into the stamp programme' for 2008 which turned out to be Commemorative Sheets similar to Business Smilers Sheets, sold at more than twice face value. Well 2009 is no exception, and we can now announce some of the additions to the 2009 programme. If you are a 'one of everything collector' I hope you've got a lot of money! Castles Smilers Sheets. In addition to Northern Ireland on St Patrick's Day (17 March), the sheets for England and Scotland will be issued on their respective saints' days 23 April and 30 November. I assume that means we can expect the Welsh Castles on 1 March 2010, although that's not mentioned officially in the outline programme (see below). The England sheet uses the 1st class flag stamp from the Celebrating England MS, but self-adhesive. As expected there will be another set of Smilers For Kids, being 4 packs containing 10 stamps each, and 4 generic Smilers Sheets of 20 stamps. Subjects to be announced - see 2008 for possibles. A new retail book will be issued on 21 May. Containing 4 1st class gold Machins and two stamps from the 1997 Greetings issue (Iris Iatifolia and Tulipa - originally SG 1958 & 1962) now in self-adhesive die cut form. This booklet marks the 50th anniversary of the National Association of Flower Arrangement Societies and is, as far as we can recall, only the second commemorative booklet, the first being the 2001 booklet which marked the centenary of the death of Queen Victoria. 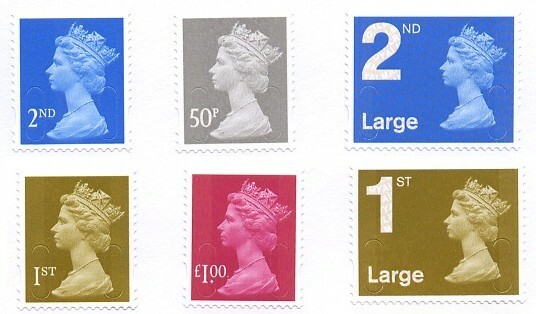 The 31 March definitives for new postage rates include the 22p in a colour described by Royal Mail as 'stone'. The picture in their Philatelic Bulletin shows it to be dark brown. The others are 17p olive-green, 62p red, and 90p blue. New country stamps will also be issued. Later in the year three Generic Smilers Sheets, similar to that issued for Beijing Olympic Expo, will be issued on Royal Mail's participation in various International Stamp Exhibitions, in Thailand, Italy and Monaco. There will also be two Commemorative Sheets similar to the Territorial Army sheet issued last year. One other Smilers Sheet is possible in the summer. Finally, the devices known universally as Faststamps but which Royal Mail have dubbed Post and Go Stamps (ie those with the Machin head on), are to be issued in packs of 5 values from Royal Mail's Philatelic Bureau in Edinburgh. The branch code on these stamps is said to be that for Bristol, but the value, etc, on the labels will be printed in gravure, by Walsall, who also print the base stamps. Thus these 5, which will be separate, not in the desired se-tenant strips, will be detectably different to those obtained from machines. We can also expect on 1 March the Castles of Wales Smilers Sheet, some more Smilers for Kids, Commemorative Sheets, and stamp exhibition Smilers Sheets. Update to 2009 programme will follow later today. For some reason the phosphor on the self-adhesive definitive stamps is not printed in the space between the stamps (known as the matrix) as on the those printed on normal sheets of 200. Whereas short or inset phosphor bands on the normal sheets would apply only to a proportion of the sheet (bottom or top row, first or last column because they are printed continuously, across all perforations), such phosphor shifts on the new stamps will apply to every stamp. This should have an impact on their cost and value. 2nd Large [10/12/08] - All are short at the foot, some sufficiently to be catalogued, but most not. £3.00 [20/01/09] - Very nearly all are 'OK'. One Cyl block seen has left and foot extreme tips clear of phosphor. £5.00 [20/01/09] - All except one Cyl block are slightly short at the top. The odd one is 100% ok.
Tell us about your discoveries! We are now able to show actual images of the new stamps to be issued on 17 February. These are scans of the actual stamps and show much more accurately than in the publicity pictures, the colours of the highe value stamps. See earlier in the blog for enlarged digitally-enhanced images of the security features. The first in what we assume will be a new five-sheet series of Smilers Sheets is a surprise addition to an already very busy March 2009 programme. 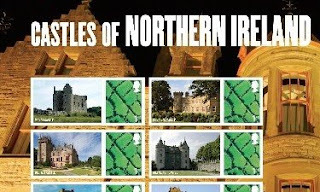 Using the 1st class Northern Ireland definitive the sheet shows 2 panes of 10 castles of Northern Ireland and will be issued on St Patrick's Day, 17th March. Click on the image to go to our website and see an image of the whole sheet, and a hi-resolution enlargement. The first copies of the new Machin definitives with Security Features are now to hand, and I've had some fun scanning them to try to reveal the security features. The 'supermarket-style' slits are not of course a problem: each stamp has 4 cuts, sort of semi-circular. These are obvious to the naked eye and can be seen more clearly on the enlargements of these images. The 'ROYAL MAIL' overprint is in a semi-visible layer, more obvious as the stamp is slanted against the light - as with phosphor bands. The semi-visible layer is an 'all-over' print, with the words ROYAL MAIL 'reversed out' ofthe part which is over the dark background (ie negative). But on the Queen's head, the words are smaller, and are 'positive', ie there is an area over the head which has a clear background, with the words printed in it. The £1 stamp is shown above, heavily overexposed and the text can be seen on the phosphor band area. The Large 2nd class stamp is shown below: the first scan is 'straight' - no adjustments. The two enhanced images show more clearly the background and head text respectively. Click on any image for a large version in a new window - for the benefit of anybody who is still unsure, there is NO green stamp. Images II & III have been digitally adapted to show the Security overprint!